Vertical integration is the degree to which the organization owns its upstream suppliers and its downstream buyers for further product processing. Contrary to the horizontal integration, which is a consolidation of many organizations that handle the same part of the production process, vertical integration is typified by one organization engaged in different parts of production (e.g. production of raw materials, manufacturing, transporting, marketing, and/or downstream processing of end products. Vertical integration describes when an organization purchases or starts a company that it either buys from or sells to and integrates this new business into its own. In case of forward integration the organization integrates its businesses toward the end customer while in case of backward integration the organization integrates its activities in the direction away from the customer. Backward integration can be a part of the organizational strategy due to the competitive benefits it provides. Organizations which governs the entire value chain are, however, very rare. Some organizations choose to adopt for forward integration while other organizations opt for backward integration. Also some other organizations continue to operate disintegrated depending on the environment under which these organizations are operating and also depending upon the future strategic planning which these organizations have done for their future operations. Forward integration extends organizational reach in the market and helps the organization in tightening its grip on the demand side. On the other side, backward integration stretches the organization’s operations towards the source of raw materials, strengthening its control on the supply side. Integration strategies of forward and backward integrations help the organization in eliminating the adverse effect of double marginalization. 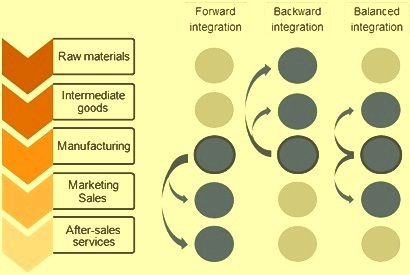 Forward integration enables the organization to respond to changes in demand more effectively, while the backward integration allows the organization to seize a stronger control over its quality of raw material supply and, thereby, its quality of final products. The following two issues are important issues which need to be considered by an organization for taking a decision on the integration strategies. Costs – The organization is to adopt integration strategies when cost of making the product inside the organization is lower than the cost of buying that product in the market. Scope of the organization – While adopting integration strategies, the organization is to consider whether moving into new area of activities will not dilute its current competencies. New activities in the organization are also normally harder to manage and control. The organization should determine the necessity of adopting backward integration, or forward integration, or both, or none after careful analysis of all the aspects associated with it. Organization engages in the forward integration strategy when it wants to achieve higher economies of scale and larger market share. The strategy is effective if the industry is expected to grow significantly and the organization has enough resources and capabilities to manage the new business. Organization pursues backward integration strategy in order to secure stable input of resources to become more efficient. The strategy is most beneficial when the current suppliers are unreliable, expensive and cannot meet the input requirement both with respect to quality and quantity. The strategy is adopted when the industry is expanding, the prices of the inputs are unstable and the suppliers of the inputs have built in high profit margins. Also like forward integration, the organization has necessary resources and capabilities to manage this additional activity. Advantages of these integration strategies are as follows. Social advantages of these integration strategies are as follows. Disadvantages of these integration strategies are as follows. Social disadvantages of these integration strategies are as follows. The integration strategies may not always be the best choice for the organization if it lack of sufficient resources that are needed to venture into a new industry. Sometimes the alternatives to integration strategies offer more benefits.